The icebreaker program is on the cut-list along with 41 other federal investment projects, newspaper Vedomosti informs. The list was discussed in a meeting between President Putin and key government ministers last Thursday, the newspaper writes. The 42 projects include investment amounting to 347.3 billion rubles, of which credits were to account for 235.5 billion. The meeting revealed major differences in the position of the country’s Central Bank and the Ministry of Economic Development. While the former proposes to boost federal project financing in a bid to vitalize the economy, the latter wants to proceed with the cut-plan. As previously reported, Russia is in the process of unfolding a major icebreaker program, which includes both nuclear-powered and conventional diesel-engine vessels. 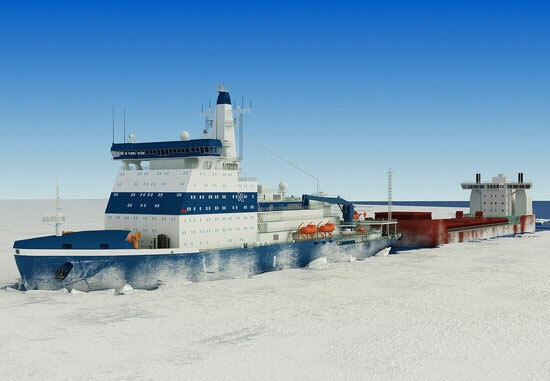 The jewel in the program is the LK-60 (project 22220) icebreaker, which will be able to ship through three meter thick ice. At least two LK-60 vessels are planned built, the first one of them, the «Arktika», is to be ready for service in 2019.